The purple/blue d20 is her favorite. Yes, she's in Fairy Form here. I grew up a gamer. I played chess with my father until I fought him to a draw when I was about 10, then we never played again. I used to read his Games Magazines when he was done with the World's Most Ornery Crossword, and I got hooked on cryptograms. In 5th grade we played board games at school sometimes, and they gave me Stratego and Careers to keep at the end of the year. I still have them. I got my first D&D Basic set (Moldvay - now available in PDF!) in 1981, and a multiverse of possibilities opened up. 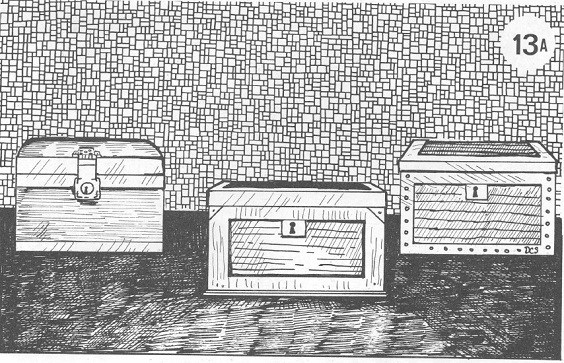 RPGs gave me a structure around which to build worlds, and to tell stories in those worlds. Sometimes the story came first and begged for a world, sometimes the world spawned stories on its own. In any case, the creativity genie had escaped the bottle, never to return. And now, I'm a father. I have an intelligent and precocious daughter, who sketches books and designs outfits and willfully has trouble listening sometimes. We build robots and play chess and read stories. It started with Princess Ruth when she was 4, which was an interactive bedtime story. We still have some of the story yet to go, since she still has to find the Dark Cave to destroy the Heart of Darkness. She told the story. I just provided details and challenged her occasionally with NPC reactions and information from her research. Recently, we've moved on to actual RPG play with her and her friends. I chose to go with Warrior, Rogue & Mage, since task resolution requires rolling a d6 and adding a modifier to beat a target number. I went into the first game with very little prep, and we all had a grand old time. I need to limit handing out Luck Points, since getting 2 6s in a row seems fairly easy. Maybe 3 6s in a row instead? Take a look at other lessons learned from the first game, if you're so inclined. All diced up and ready to roll. Santa got her a pack of 4 Hello Critty dice in her stocking. 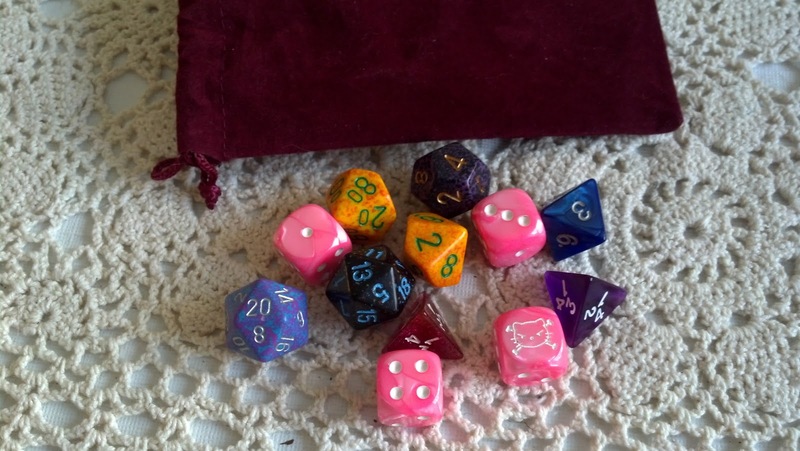 Last week we went to our FLGS The Whiz to pick up a full set of dice and a starter dice bag. 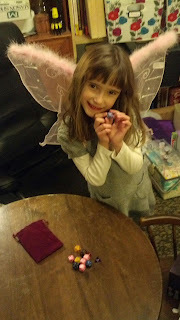 She picked through and got different colors that she liked, and now she has dice that are all hers. She's outfitted and ready to go for the next game on Saturday. She's excited. Her friends are excited. Hell, I'm excited. I've started a Game & Potluck Night on the second Saturday of the month at my church. We had over 50 people come out for the first event in January. I hope to do at least that well for the next Game & Potluck Night in March. Eventually we'll put out a tip hat and see if anyone wants to chip in for new games. And we may have a table for RPGs before long. We'll see what the market will bear. That's the glory of gaming. It's discovering something new to pique the interest. It's allowing everyone at the table to create or change the world or story in some way so everyone is invested in the game. It's keeping everyone coming back for more to build on the pieces they've invested in. It's sharing a table with people you like and making memories that get better with every retelling. I hope to infect future generations with the gaming bug. I think I'm doing fairly well so far.